I recommend Casa Sunshine for family vacations or big celebrations with friends. With 10 bedrooms and three levels of space, this villa was made for large parties of travelers. It’s in a residential area, which pretty much guarantees peace and quiet, but Oyster Pond and Phillipsburg are only a short drive away. Casa Sunshine is a beachfront family vacation villa on the Dutch side of St. Martin. 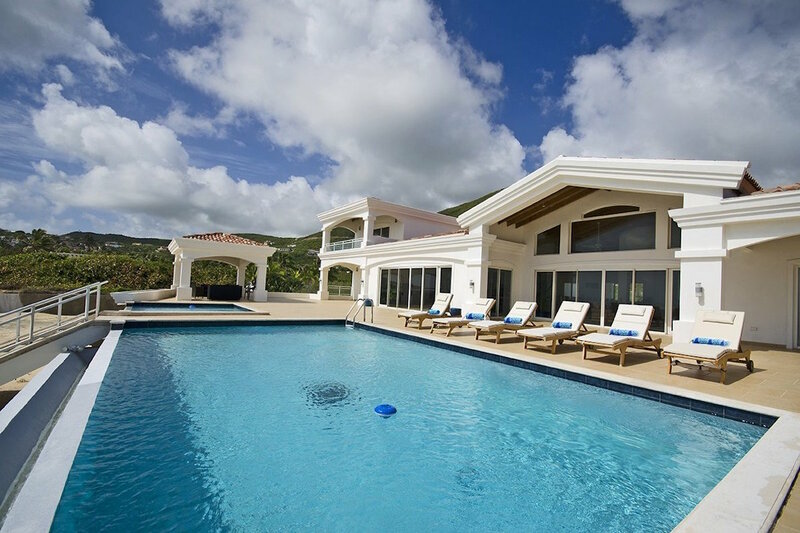 Bring a large family or a group of friends to enjoy Guana Bay’s sunshine and tropical breezes. Ocean views give way to St. Bart’s on the horizon, and a beautifully private white sand beach is steps away. Guana Bay is part of a protected marine reserve where sea turtles may nest, which means the beach is not open to heavy machinery or development. A set of stairs leads down to the beach from the pool deck, and beach chairs are provided. Casa Sunshine has two pools, one for swimming, playing, and exercising and one for relaxing or small children. The gazebo shades an outdoor living space, and loungers line the pool for sunbathing. After lounging, guests can exercise in the home gym on resistance and cardio machines. Approximately 5,000 square feet of living space fills Casa Sunshine’s interior. The villa’s three levels include a massive living area, dining, and an open kitchen with a bar. On the main level of the house, there are four large bedrooms and four and a half bathrooms. Each of these suites has a king bed, although one can be separated. Upstairs, there are two king suites and one queen suite. On the lower level, there are three king suites. All bedrooms are air-conditioned, and each has a TV with cable programming. Casa Sunshine offers total privacy and relaxation. The villa is northeast of Phillipsburg’s shops and restaurants and south of Oyster Pond’s marina. Upon arrival, guest will call the local villa rep from the airport; the local villa management company numbers will be provided by WhereToStay.com and will also be published above the phone. A villa rep will meet guest at their car rental agency. Guest will need to pay for their own transportation, either taxi or rental car. This offer is good for rentals of 6 bedrooms or more.